East ham, a suburb in eastern London known for the variety of Indian restaurants, temples, shops selling clothes, jewellery, utensils..You name it and you will find an item from any corner of south Asia here. As you walk through the street , variety of nationalities, ethnicities, languages , attires are noticed. Every alternate shop specialises in some food .. Ranging from international restaurant chain to pani Puri and paanwala. Some shops here resemble as if they contain whole of famous Tulsi baug of Pune . Being stopped and directed to palmist, jyotish or some Omni potent Baba is not new here. Temples and madarasas stand by each other fast replacing old pubs in this area . Each time , i visit new shops , new restaurants are noticed . The high street has changed immensely in last 10 years now incorporating eastern European communities that are looked down upon by our Asian miliu with the same disdain as one sees in Mumbai for Bihari bhayyas . Every visit to this place, i return with happy tummy , having wholesome food and bags full of seasonal vegetables and fruits . There is something always that amuses me about this place ...At times it is a small chit chat with some shop keepers , a long forgotten item suddenly discovered in some shop, tasty dabheli, paani Puri thela or a paanshop. Today afternoon as i walked passed the street , fragrant jusmine and jaai gazra cought my attention. I entered the shop to make a payment and noticed that it was a shop selling variety of God stationary ...Such as frames , Puja items etc. This frame was at the front..surly waiting for some baniya to buy it so one of the gods may shower the blessings! There is something very distinct in the way Jesus is portrayed..This colourful picture of Jesus is very indianised version that is often seen in the homes of Goan and Mallu friends . 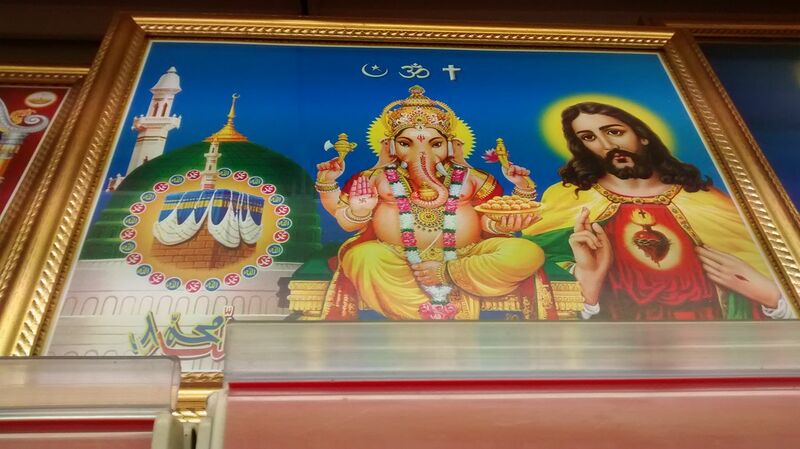 Jesus in red, blue attire with dark black hair ..here sitting with Ganesh and a picture of Islam's worship place . A symbol of our Bollywood secularism.